I'm Happy Just To Dance With You was written by Lennon and McCartney as George Harrison's vocal spot on the A Hard Day's Night album. The song was purposefully written with Harrison's vocal range in mind. We Wrote I'm Happy Just To Dance With You for George in the film. It was a bit of a formula song. We knew that in E if you went to an A flat minor, you could always make a song with those chords; that change pretty much always excited you. This is one of these. Certainly Do You Want To Know A Secret was. This one anyway was a straight co-written song for George. We wouldn't have actually wanted to sing it because it was a bit... The ones that pandered to the fans in truth were our least favourite songs but they were good. They were good for the time. The nice thing about it was to actually pull a song off on a slim little premise like that. A simple little idea. It was songwriting practice. I'm Happy Just To Dance With You was recorded on 1 March 1964, The Beatles' first session on a Sunday. They completed three songs in three hours; the others were Long Tall Sally and I Call Your Name. I'm Happy Just To Dance With You was the first to be recorded that day, and took four takes to get right. That was written for George to give him a piece of the action. The only known non-EMI version of I'm Happy Just To Dance With You was recorded on 17 July 1964 for the BBC's From Us To You programme. It was taped at the BBC Paris Studio, London, and first broadcast on 3 August. A bootleg version is also in circulation which features the BBC backing track only, captured without Harrison's multitracked lead vocals. This (http://www.dmbeatles.com/song.php?song=133) page says a “loose-skinned Arabian bongo” were used on the song. WHo is correct? You’re right: Ringo played an Arabian drum during the overdub process (it can be during in the verses). George doesn’t play lead guitar in this one, it’s just a simple rhythm part (Lennon played the lead-like rhythm part). Ian MacDonald, in Revolution In The Head, identified it as an African drum. Do we know for sure it was an Arabian one? Until I can be sure I’ll leave Ringo’s contribution as just ‘drums’. In his sleeve notes for With The Beatles, Tony Barrow said that Ringo played a “loose-skinned Arabian bongo (don’t ask me where he picked that up! )” on Don’t Bother Me. I wonder if the DM Beatles site is confusing two songs sung by George Harrison. Ringo played loose-skin arabian bongo on “Don’t bother me”. For this one, he played an african drum, the same that George is going to play on “Mr. Moonlight”. In the remaster version of this song, you can hear the drum in question extremely clearly. It sounds like the same drum they use on Mr Moonlight. Maybe Ringo borrowed the Arabian Drum from Bob Dylan (Sad Eyed Lady Of The Lowlands). For sure, there is a different kind of bongo or drum. Paul said that “I’m Happy Just to Dance With You” was a 50/50 collaboration with John, as this site said. However, John listed the song as one that he wrote (without Paul) in Hit Parader, April, 1972. Both this and the previous made-for-George song “Do You Want To Know A Secret” have melodies that stick to the scale to an unusual extent. I wonder if John though George’s singing worked best on scales back then? What I love is the transformation in the film “A Hard Day’s Night” when the, um, “square” (grownup, not hip) dancers are dancing to this melody played by the rehearsal pianist in a triple rhythm. It sounds vaguely familiar to the casual Beatles fan but might not be fully recognizable. Then the dance rehearsal is over, they leave the stage, the beat changes, and the Beatles sing and play the song their own way. It’s magical. One of the very few Lennon-McCartney songs Beatles performed live of which no recording is known to exist. If it does, please enlighten me. A Hard Day´s Night film is excluded, as it is not a real live recording. The song was only used on stage during the October-November tour of the UK, when they still played cinemas and small halls. The melody is typical Lennon with the hammering on the same note and the first short notes notes followed by three long notes .It´s a mix of Lennon music and pop music from 1930s, I think. Johan/John: we get it, you dislike Paul. Your constant anti-Paul posts are boring. Get beyond it, please. Thank you. Johan, no one truly knows who wrote what for any of these songs except the imperfect minds of two guys with large egos. Your willingness to only believe what John says shows implicit bias towards him, just as only believing Paul would be imprudent… it just seems like Lennon fans are louder, more indignant and less compromising. While the truth is likely in between their two accounts, I think McCartney has the more consistent memory and didn’t frequently go on record talking about Beatles stuff while the wounds were fresh and he had bitterness toward his former partner. I also think many Lennon quotes (including ones about Paul sabotaging his songs like Strawberry Fields) show that he could be manic and unreasonable. This makes the lack of compromise from Team Lennon seem narrow-minded at best and hateful at worst. Have you any musical points of view? Please tell me what is typical McCartney in this melody? I said the melody is “typical” for Lennon. I didn´t say I know he wrote it. When singing “…I´m happy just to …”= short notes on the same note, “…dance with you…”=three long notes. All this is typical Lennon. Yes, I’m a musician and I understand music theory, but I don’t assert that this song favors one writer over the other. To your claim that only Lennon wrote melodies with that specific sequence, I would direct you to I’m Down, The Night Before, the opening and chorus of Getting Better, the chorus to Fixing A Hole, the chorus to Baby You’re a Rich Man, Two Of Us, You Never Give Me Your Money, and Golden Slumbers. Besides, even if Paul hadn’t written any songs that fit those parameters, that wouldn’t substantiate his songwriting absence. This song is very John. I guess John did the George’s song and Paul did the Ringo’s stuff. A nice number written by John and Paul for George, I suspect mainly by John. 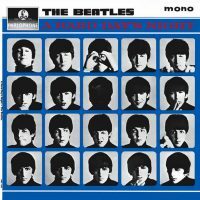 It is catchy and fits in well to the “A Hard Days Night” film and album.Great sequence in the film. This is one of my favourites from this period – and of course George made a fab job of it. Excellent song. Love the busy rhythm guitar playing…if you listen carefully, they never seem to play the chords exactly the same way twice. There some embellishments going on like a B7aug and an E6. I really like the key of C#m and the relative E major. It’s the same as “Do You Want to Know a Secret”, “It Won’t Be Long”, “Ask Me Why”, “And I Love Her”, and the verses on “You’re Gonna Lose That Girl”. All those are top Beatles songs for me! In bar three of this great song I hear a guitar playing some sort of choked off notes that have a bit of harmonic ring to them. Does anybody know how that was done? I’ve never heard anybody mention those notes being played anywhere. It sounds like an overdub. Won’t you please please help me?! I was wondering why a slower version of the song was used in “A Hard Day’s Night. “. The album version is much livelier. This was my first favourite beatle song. Love it still!